In 2007 Harman Sidhu, earlier a mechanical engineer by profession, formed ArriveSafe, the Chandigarh based NGO dedicated to road safety after a traumatic road accident that left him paralysed neck downwards. ArriveSAFE?s mission is, ?To make people get back home safe because roads can kill or maim.? It has a team of road safety experts, road transport specialists, engineers and volunteers and active and retired personnel from the police and transport departments, colleges and universities. The NGO has been interacting and assisting the administration and police and highlighting road safety issues in the media. As advised by Amitabh Singh Dhillon, the then Superintendent of Police, Chandigarh Traffic Police, Sidhu developed a comprehensive online resource on Safe and Responsible Driving for the Chandigarh Traffic Police in 2005. This brought him the prestigious Prince Michael International Road Safety Award in 2006. ArriveSafe follows the best practices manuals developed jointly by the World Health Organization, Global Road Safety Partnership (GSRP) and the UK based FIA Foundation. It works on the four pillars of road safety outlined in the U.N. Decade of Action for Road Safety 2011-2020 plan – improving road safety management, safer road design, and safer vehicles. Campaigns about drunken driving form a major focus of ArriveSafe. According to Sidhu, driving under the influence of alcohol is responsible for 30 to 50% of road deaths and serious casualties depending on the country. He says, ?The consumption of alcohol, even in relatively small amounts, increases the risk of being involved in a crash for motorists and pedestrians. Not only does alcohol impair processes such as vision and reaction time which are critical for driving safely, it is also associated with impaired judgement. While the profile of drunken drivers differs from region to region, there are a number of factors that increase the risk of crashes involving drinking and driving. For example, young male drivers are at a high risk of such crashes, and crashes involving alcohol are more frequent at night.? A study by NIMHANS (National Institute of Mental Health and Neurosciences), Bangalore, shows that hospital surveys have revealed that nearly 28% of traffic injuries are attributable to alcohol. According to the GRSP, even when legislation does exist in low and middle-income countries, it is very rarely applied. The general public is often unfamiliar with the drunken driving laws, which are often insufficiently enforced by traffic police. In many cases, the police is not equipped to conduct alcohol tests for drivers and laws without enforcement are useless. ArriveSafe has adopted a three-pronged strategy to tackle drunken driving: Conducting awareness campaigns for road users, capacity building of enforcement agencies for stricter enforcement and reducing availability of liquor along highways. The NGO has worked as local partner for GRSP in the `10 project being conducted on a pilot basis in Jalandhar, Punjab and Hyderabad, Andhra Pradesh. The `10 (Road Safety in Ten Countries) is WHO road safety project funded by Bloomberg Philanthropies that is being carried out in Brazil, Cambodia, China, Egypt, India, Kenya, Mexico, Russian Federation, Turkey and Vietnam. `10 aims to tackle the two important issues in road safety ? Drunken Driving and Speeding. The other project partners are World Health Organization, World Bank and the US based John Hopkins University. If the project is successful, it will be extended to other parts of the country. As part of its `10 activities, ArriveSafe conducted workshops for the traffic police on the need to need to step-up the enforcement drives and on how to conduct these campaigns. Workshops were also conducted for community based organisations and local NGOs showing them how they could be a part of these campaigns. ArriveSafe also provided Ananda, an Andhra Pradesh based NGO run by a UK based NRI, the content for their publication ?Your Child?s Road Safety Handbook?. They distributed 4000+ copies in some districts of the state. In its campaigns, ArriveSafe teaches people why drinking and driving is unsafe. They are made aware that there are laws in place, there is a high risk of being caught if they break the law, and that the consequences are severe. Interactive sessions are conducted, especially among the youth, using Fatal Vision goggles and other equipment. Fatal Vision Simulator Glasses are special goggles that simulate the visual impairment caused by drugs or alcohol. Viewing through the goggles is rather clear, but confusing to the mind. Both the wearer and those observing are convinced that such impairment makes driving vehicles, which is an activity with known risks, very dangerous. One of the main target groups is the youth from universities and colleges. Student leaders are encouraged to support the enforcement of drunken driving campaigns. 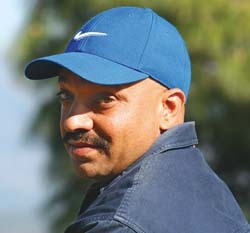 This has a personal connection for Sidhu since he was just 26 years when he was incapacitated by the tragic road accident. Punjab University, Guru Granth Sahib University, Fatehgarh Sahib, Punjab, DAV College, Jalandhar, and DAV School, Karnal, Haryana, Khalsa College, Chandigarh, government and private schools in Chandigarh, Mohali & Panchkula. At colleges ArriveSafe uses interactive games and Fatal Vision. A programme especially conducted by ArriveSafe in May this year for youngsters in colleges and schools was ?Pedestrian Safety ? A Youngster?s View?. About 128 students from 60 schools participated. The programme was part of the second stage of The Long Short Walk (TLSW). The TLSW was a part of the Second UN Global Road Safety Week. It campaigned for the rights of pedestrians and children on the road to be recognised and urged greater investment in safe footpaths, cycle-ways and crossing points, on streets with lower speed limits, especially around schools. 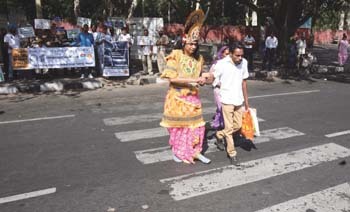 As part of the events, a volunteer dressed up as Lord Rama to highlight that ?Only Divine Intervention can Save Pedestrians?. A total of six events were conducted with the support of the police in Chandigarh city and Haryana state in the cities of Chandigarh, Karnal in Haryana and on a busy toll plaza on NH1, reaching out to more than 20,000 people. 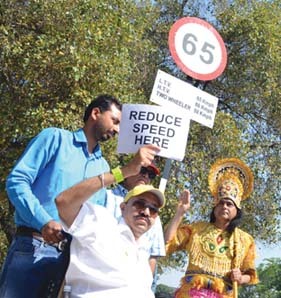 As a result of the TLSW campaign the Chandigarh Administration decided to reduce the speed limit by 5 Km/hr on the city roads. Another set of campaigns is for the users of non-motorised vehicles such as cycles, rickshaws & rehris (handcarts) and pedestrians. According to Sidhu, they need to be educated since they feel that since motor laws do not apply to them, they can drink and ride on the roads without any fear. As part of its Project Jugnu (FireFly), ArriveSafe puts high-quality reflectors on these vehicles so that they are visible to other road users. A study conducted by ArriveSafe found that 65.4% of the car drivers were not using side view mirrors on NH1. Another study found that more than 85% of city residents were worried about unsafe roads and therefore avoided cycling. The results of these studies were shared with the Haryana Police. As a result, the city administration decided to upgrade the cycle tracks and pedestrian walkways and the speed on the city roads was reduced by 5kmh on the city roads. According to Sidhu, India is probably the only country in the world where alcohol is so easily available along the national and state highways. There are large hoardings too, advertising popular liquor brands. These hoardings distract road users and induce them to buy liquor and drink in the nearby government approved taverns, and then continue to drive, often leading to disastrous results. In February 2012, ArriveSafe began a project to remove liquor shops along highways in Punjab. Using the Right to Information (RT), it sought information from the NHAI (National Highway Authority of India), the Pujab PWDs (Public Works Department) and the state Excise Department. ArriveSafe found that there were 185 unauthorized liquor shops on a 291km stretch of the busy National Highway 1 (NH1) from Panipat (Haryana) to Jalandhar (Punjab): a liquor shop approximately every 1.5km. With this and other relevant information, ArriveSafe filed a PIL (Public Interest Litigation) in the Punjab and Haryana High Court. In July this year, the high court directed that the unauthorised liquor shops be removed. ArriveSafe conducts training sessions for government & police officials and identify what Sidhu calls, ?Mother Trainers? who can train others. Since, officials get transferred after a period of time, these sessions have to held repeatedly. It has also assisted in the development of a computerised and centralised Traffic Rule Violators? Data Collection System for the police department. Conventionally, the traffic police cells of the district police issue challans to traffic violators which they either pay on the spot, or to the District Police or in the Court. This was a paper based work and it was very difficult to analyse the data and to do things like identifying a habitual offender, the number of challans issued against him / her, the types of challans issued etc. But the computerised system is able to do all this. With the new system, once a challan is issued, it is mandatory to punch in the data in the server ensuring important details such as the violator?s name, driving licence number, the vehicle?s registration number and the type of offence is recorded. Details of more than 5 million offences have been recorded in the system. Another system that ArriveSafe helped develop is a data collection and automatic analysis systems for identifying black spots. Black spots are stretches on the road which are quite accident prone. This data helps in mapping the crash prone locations so that remedial measures are taken and the results can be compared. In the earlier manual system, the police investigating officer played an important role in recording the details of a road crash. Vital data such as the date & time of the crash, type of collision, types of vehicles involved, number of victims, age, and other details of drivers etc. were saved in a subjective manner in the FIR, often with no clear references of the location. It was very difficult to study and analyse this information. In the new system, ArriveSafe provided the investigative officers with an objective form to fill in the crash details. They have to mostly select options and enter location details (using the GPS devices provided to them). The filled-up form is handed over to the data operators in the Police Stations/District Units who enter this information into the software. The locations get plotted on Google Map (fatal crashes in red, serious in orange and minor in green) and all data needed for the 29 fields to generate the standard reports required by the NCRB (National Crime Records Bureau). This system has been deployed on a pilot basis by PRBDB (Punjab Roads and Bridges Development Board), a World Bank funded project. ArriveSafe has conducted training sessions for traffic police personnel in the city of Jalandhar as well as the Haryana state police on how to conduct enforcement drives on drunken driving. The training sessions have broadly covered topics such as how to set up traffic barricades, legal aspects of enforcing drunken driving campaigns, techniques to deal with drunk drivers so that they don?t get violent etc. It also advises the police on procurement strategies for buying road safety related equipment. ArriveSafe has been putting safe driving messages on the boom barriers of several toll plazas ? examples being the toll plazas in Haryana on national highway NH8, on NH1 at Karnal and on NH22 at Derabassi in Punjab. One of the messages displayed has been how usage of mobile phones distracts drivers while driving. The messages cost very less to display but are highly effective since all vehicles stop at the toll plazas, and the drivers and other passengers get enough time to read them. A survey of 200 commercial drivers conducted by ArriveSafe found that almost 84% of the drivers remembered the latest two messages put on the boom barriers. Sidhu says, ?We have a golden opportunity in the form of the UN?s Decade of Action for Road Safety which is being observed from 2011-2020. Countries like Norway, United Kingdom and Australia etc. which have reduced their road crash rates have shared their resources and measures that they have taken to do so. Our governments at the national and state levels can study these, tailor them to suit the Indian environment and implement them. ? Previous: Interview:?The Barco solution is based on the fact that making the right decision is about seeing it. ?